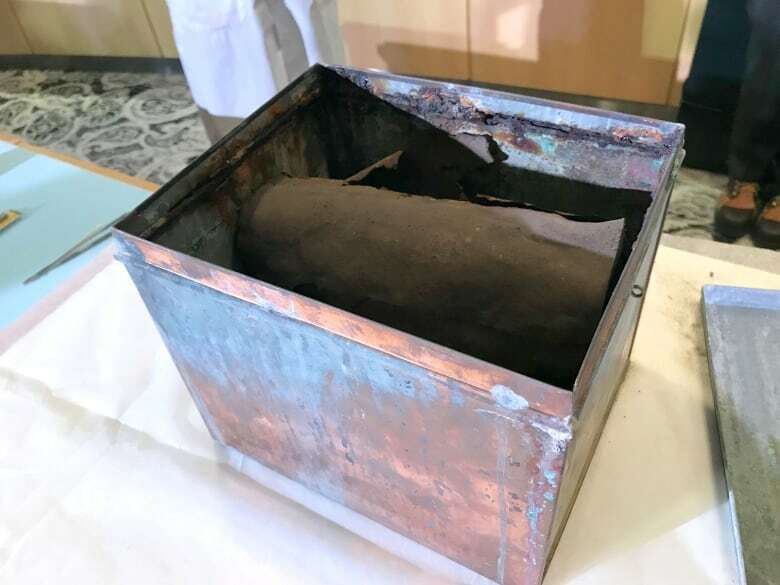 City hall staff took a trip back in time Thursday, without the need for a flux capacitor — opening a time capsule that was sealed in 1908. City hall staff took a trip back in time Thursday — without the need for a flux capacitor. 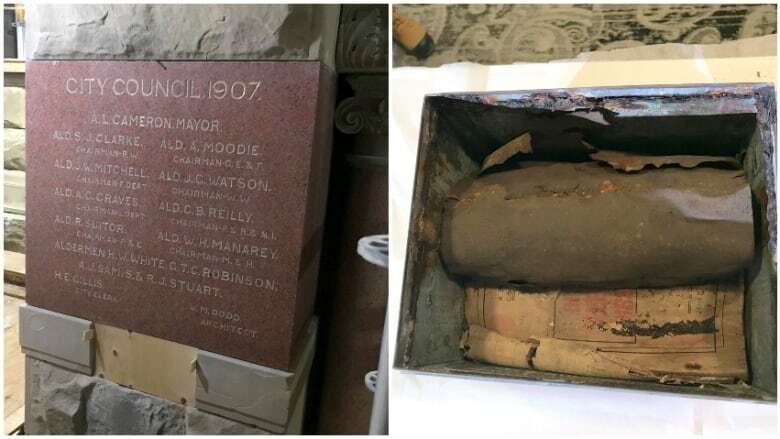 Mayor Naheed Nenshi had the honour of removing a time capsule that was placed inside Old City Hall on Sept. 15, 1908, during construction of the landmark sandstone building. He called the time capsule a snapshot of Calgarians from a century ago. "These are records of people. These are records of the people who dreamt big, who wanted future generations to benefit from their investment and their work," he said after removing the car battery-sized copper box. Financial report, the City of Calgary, 1907. Voters' list, City of Calgary, 1907. Album of Dominion exhibition, Calgary, 1908. Report of Grand Lodge of Masons of Alberta, 1908. Report of Grand Lodge of Oddfellows of Alberta, 1908. Report of General hospital, 1907. Report of school board, Calgary, 1907. Coins, 50¢, 25¢, 10¢ and 5¢, Dominion of Canada. Copy of history of Roman Catholic Church, Calgary, 1907. Medal of chairman of police department. A list of members of fire department. Report of Knox Church, Calgary. A list of members of police department. Minutes of Alberta conference of Methodist Church. Yearbook of the Central Methodist Church. Copy of the Daily Herald newspaper. Copy of the Morning Albertan newspaper. Copy of special edition of the Albertan newspaper. Copy of the Daily News newspaper. Copy of the Eye Opener newspaper. "What's unique about it is an assemblage, it's a curated collection representative of the times and the people involved," historian Harry Sanders told the Calgary Eyeopener (which was named after Bob Edwards' iconic publication). "If you think about what it is meant to be, that it isn't something special, it's just representative of what the community was like at the time this building was placed. If those are the expectations, then I think it's pretty spectacular. We're getting the very tactile items the people behind the construction of City Hall thought were important for us to have." A conservationist will now unpack the materials and see what can be salvaged. 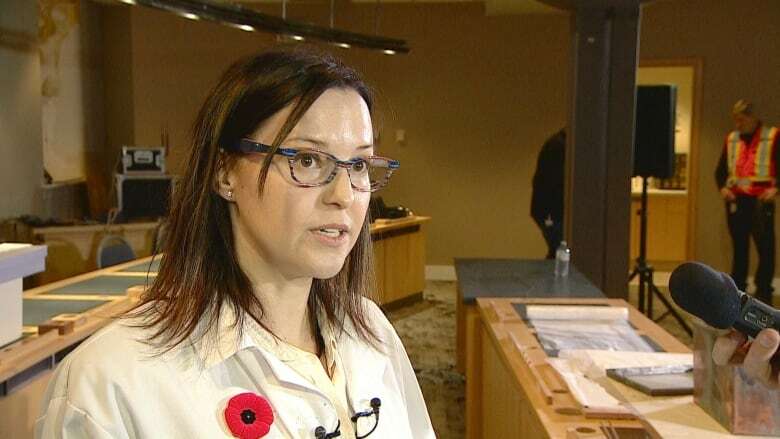 "They weren't taking into account that there would be humidity or snow or rain or things coming through," said Lisa Isley, who is the paper conservator at the Glenbow Museum. "And honestly, they didn't have the knowledge that we have now when we do put together time capsules of what could potentially go wrong — mixing metal with paper obviously creates rust and corrosion." The next step, said Isley, will be "to give it a chance to breathe, to acclimatize, because it's been in this microclimate for 100 years." "A lot of what's done next is documentation," she said. "It's really important that we get a lot of photos of the condition of the box, how it was oriented in the cavity and then slowly, as things come out piece by piece, we'll document that as well." And it's not the only time capsule at City Hall as another is set to be opened 66 years from now. That one was placed in the Municipal Building — which was constructed in the mid-1980s — and is set to be opened in 2084.